Published on: February 13, 2019 | J. Bradley Smith, Esq. Only a small percentage of cases make their way to the United States Supreme Court. The case of State v. Mitchell is one of the chosen few that will be heard by the justices in the coming term. The case revolves around the issue of implied consent. State v. Mitchell originated in Wisconsin, but its content is not a stranger to North Carolina. The North Carolina Supreme Court heard a case about implied consent in State v. Romano. In Romano, the North Carolina court found that withdrawing blood from an unconscious DWI suspect violated the Fourth Amendment because there was no exigent circumstance. Published on: November 21, 2018 | J. Bradley Smith, Esq. In North Carolina, drivers can be charged with driving while impaired (DWI) if they are under the “influence of an impairing substance,” have a blood alcohol concentration of .08 or more, or are driving with any amount of specific controlled substances in their system. For most people, when they are charged with a DWI, they feel discouraged and like there is no way the situation will end with a positive outcome. Yes, a DWI is a serious offense that law enforcement is adamant about prosecuting it. However, this does not mean that anything that law enforcement does while arresting you or while suspecting you might be impaired is acceptable. Like anyone, law enforcement officers can make mistakes. A mistake by law enforcement could help your case. Police must follow a strict protocol. The following are common mistakes to look out for in a DWI arrest. Published on: May 12, 2016 | J. Bradley Smith, Esq. A New York woman with a 0.33 blood alcohol content recently beat a DUI charge based on an extremely unusual defense: a rare medical condition turns her body into brewery. Published on: January 19, 2016 | J. Bradley Smith, Esq. Charlotte DWI Lawyer Brad Smith answers callers’ questions during a 30 minute radio interview with the Legal Forum. Recorded in Charlotte, Mecklenburg County North Carolina. Most people have heard of ignition interlock devices before. People are vaguely familiar with the idea that a device is attached to your car that you must first blow into before the ignition will turn over. Beyond this bit of information, most people are in the dark about the specifics for how and when ignition interlock devices are used. To find out more about ignition interlock devices and how they work in North Carolina, keep reading. Published on: January 27, 2015 | J. Bradley Smith, Esq. 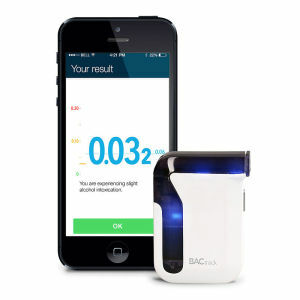 New, portable breath-testing machines sold by Breathometer, Inc. and other companies are making waves in the public marketplace, particularly among college-aged and twenty-something adults. Users of the device in North Carolina should beware: it will probably not help you if you are pulled over for drunk driving. The original Breathometer machine plugged directly into the audio jack of a smartphone. The latest “Breeze” product works in a similar fashion, using “a next-generation electrochemical fuel cell sensor[. ]” It is an “FDA registered, law-enforcement grade product,” according to Breathometer, Inc.